Back to the Roots. At the moment the Toshiba Satellite L40-14N is among others top in competition about the most reasonable available notebook. It tries to especially score points by a price of clearly below 1000.- Euro and should, thereby, attract possible customers who just demand basics. 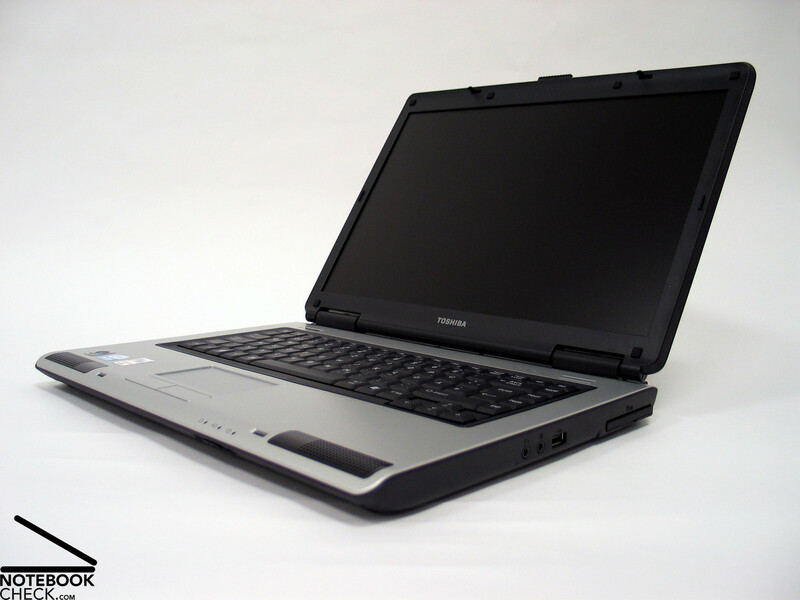 Office applications, wireless Internet access, DVD and music playback are no problem for the Satellite L40-14N. 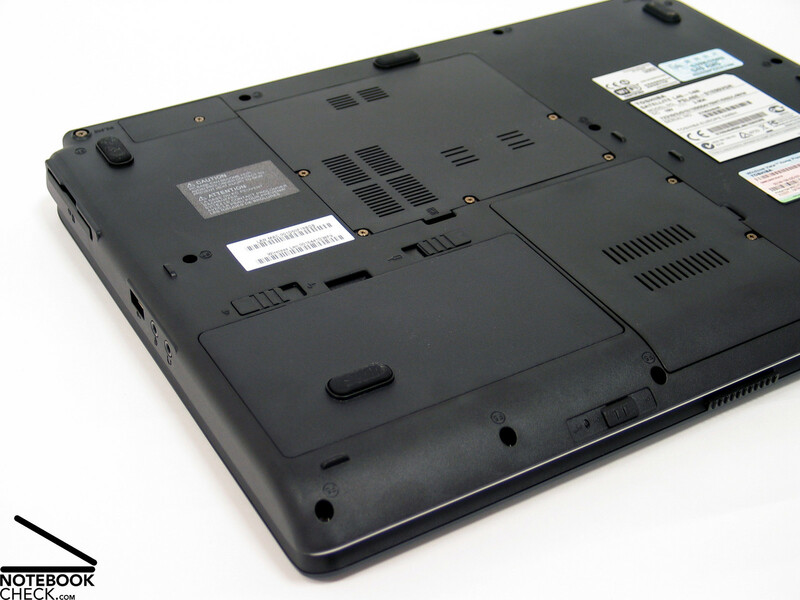 The Toshiba Satellite L40-14N's case well reflects the general characteristics of the notebook. The L40's design is very decent without any striking colors or design aspects, least of all gadgetry with light. This notebooks basically tries to attract price-conscious customers by a decent gray-blue and black keyboard and silver palm rest areas. The chosen forms are simple, so, they contribute to the L40's worthy appearance. 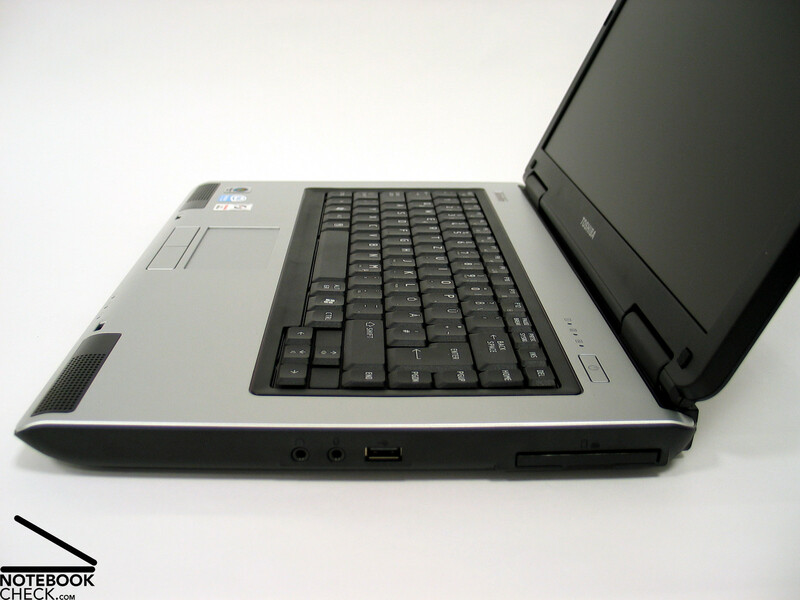 However, the construction of the case, the lid, and the front edge, make it easy to have the L40 pegged as Toshiba notebook. For those who are not really insiders, there's also a highly visible logo on the lid. 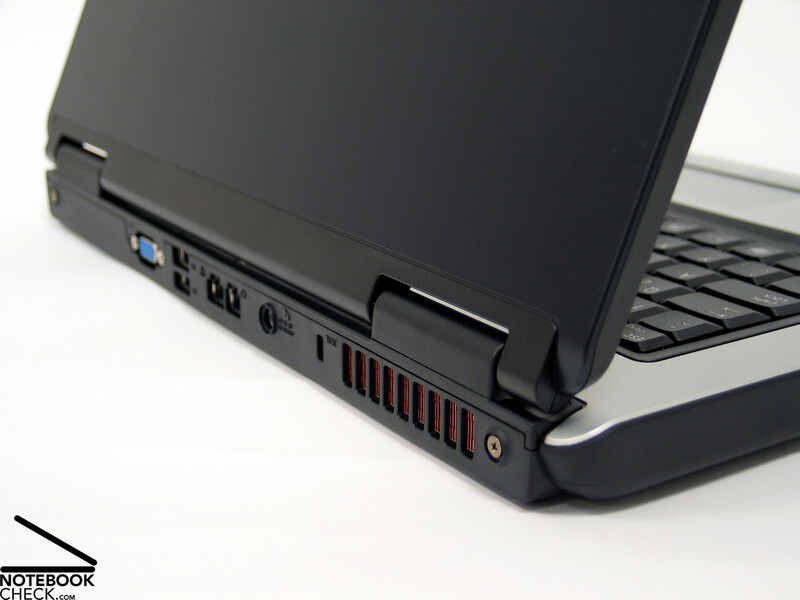 The plastic look and feel of the case when using the notebook is also distinctive. The haptics are rather moderate, however, the potential buyers of the Satellite L40-14N won't really mind. However, the L40's case still seems to be passably robust. The flexural rigidity and pressure resistance of the case is alright. So, basically using plastics was regarding these aspects unproblematic. Considering the low price, also the workmanship is alright. The only weakness is the slightly wobbling DVD tray. The display also left a good impression. Its flexural rigidity is also passable and its pressure resistance is good. Also the hinges appear to be robust and keep the display's position without problems. 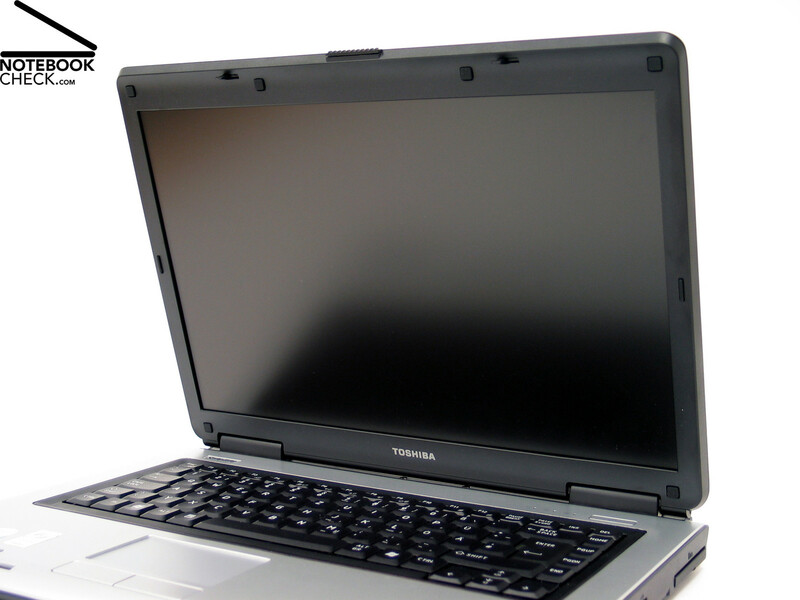 A ramshorn hook keeps the Toshiba Satellite L40 closed during transportation. 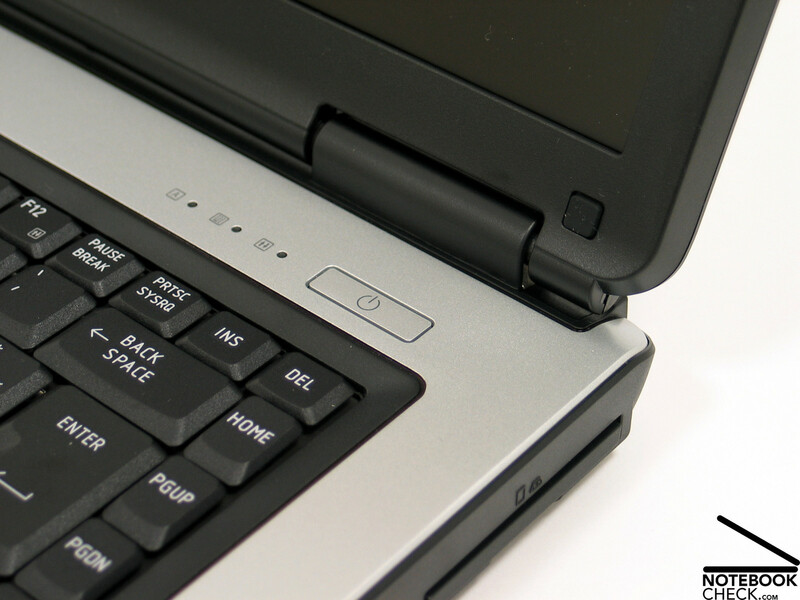 The provided ports are user-friendly located near the back of the flanks and at the back side of the notebook. However, only the most important interface are provided: Three USB 2.0 ports, VGA out for connecting an external screen or beamer, modem, and LAN (10/100 Mbit) , and two 3.5mm jacks for microphone respectively headphones. 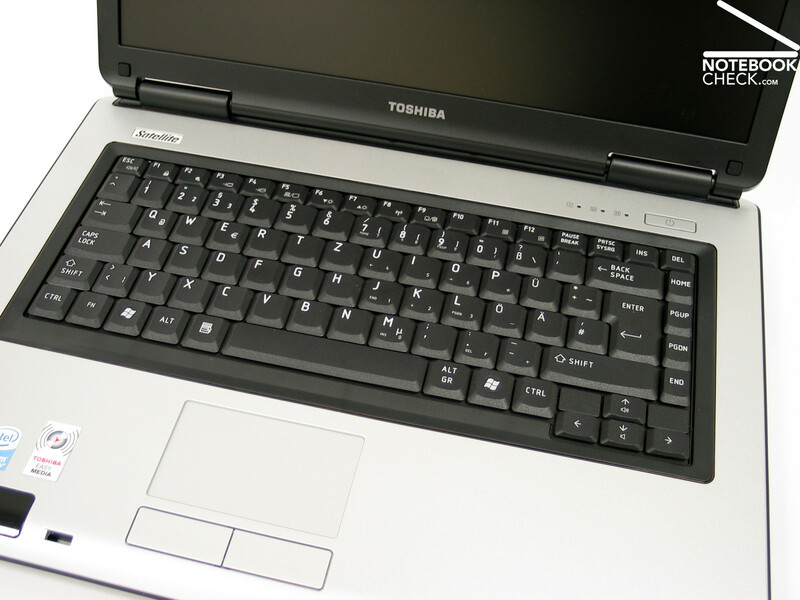 The keyboard comes with a typical Toshiba layout. The size of the keys is standard and the enter key extends over two rows. Despite it is not obviously structured the keyboard is user-friendly. The key feedback is rather clear. However, in practice, typing feels a little rickety, because the side lead of the keys is obviously too low. 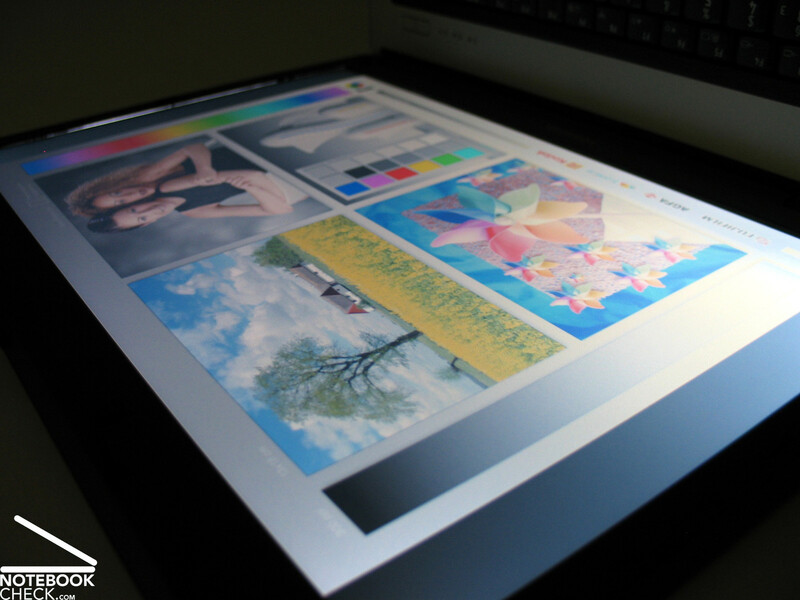 On the one hand the surface of the touch pad is user-friendly and the touch pad allows a precise navigation. However, its position is rather low compared to the case. Also its buttons could not really convince. It was cumbersome to use them and their clicking noise was rather loud and nasty. Neither the horizontal nor the vertical scroll regions are visually labeled. 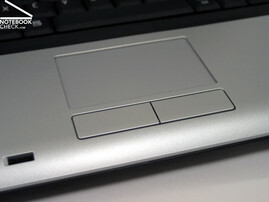 The Toshiba Satellite L40-14N does not provide any hot keys. There's only a switch for enabling/disabling the wireless communication at the front edge. All other options, e.g., volume control, have to be configured via standard keyboard by means of FN keys. The display is rather untypical for the consumer market. 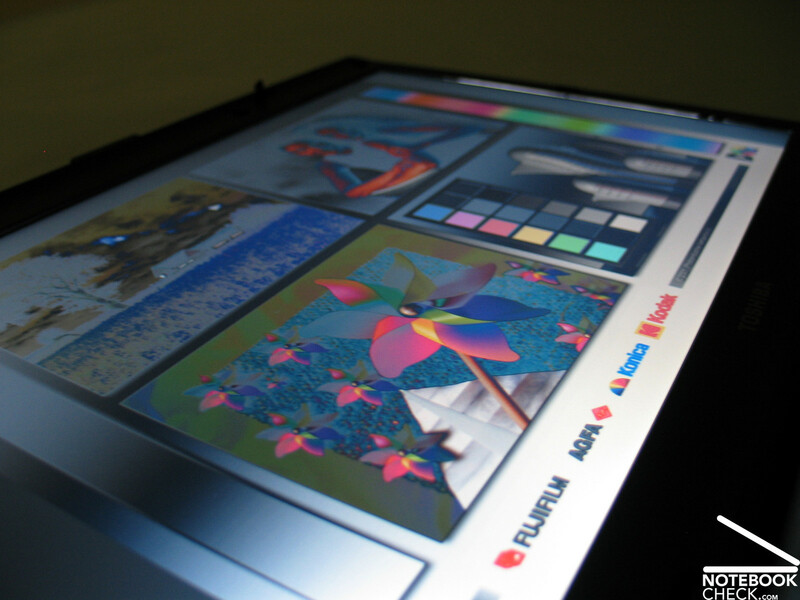 Its a display with widespread WXGA resolution that is 1280x800 pixels, however, its surface is matte. So, it hardly reflects. 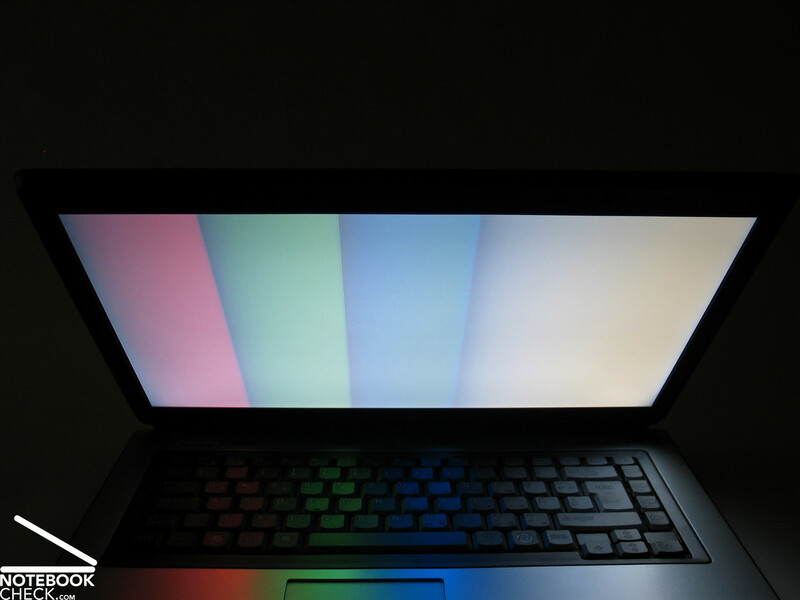 Also, the brightness of the screen is overall positive. Brightness levels of a maximum of 210.7 cd/m² measured in the left bottom region and a also still passable average brightness of 180 cd/m² are alright. 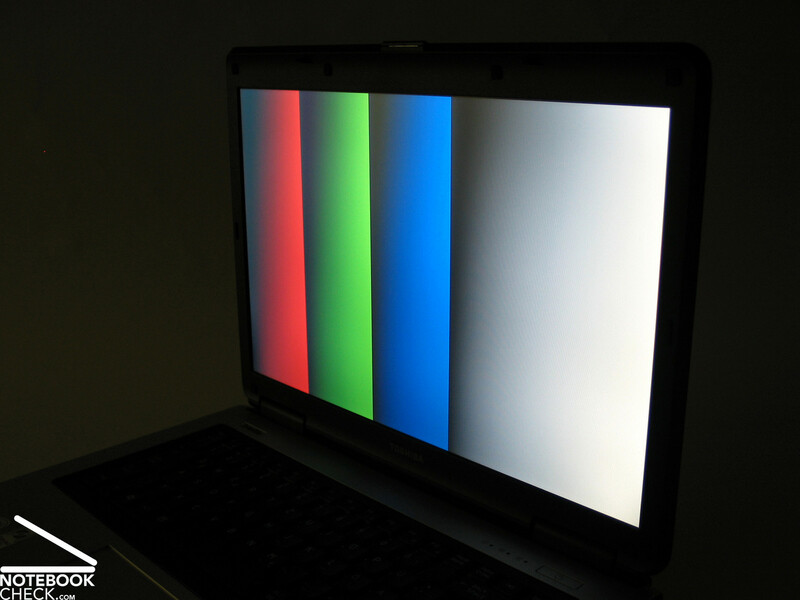 However, the illumination of the panel is only 75%, because the brightness diminishes in the upper corners. 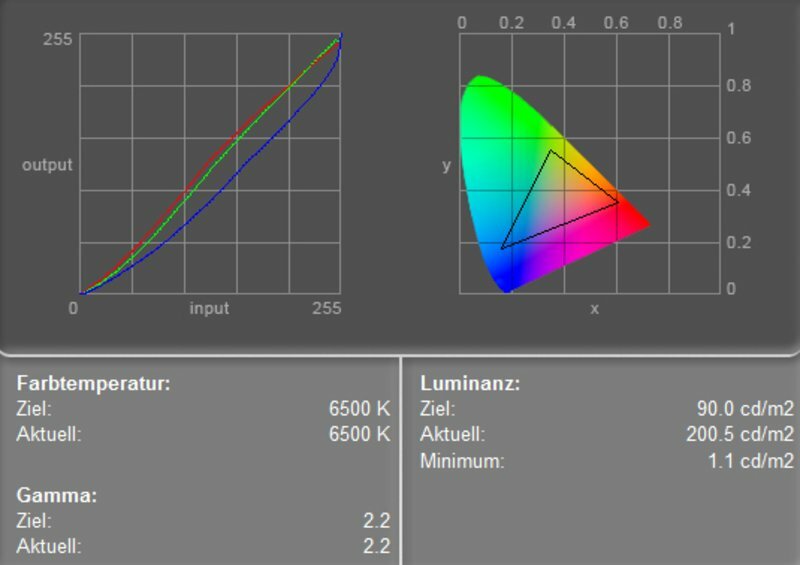 The maximum contrast of 192:1 is also due to a relatively high black value of 1.1 cd/m² only moderate. 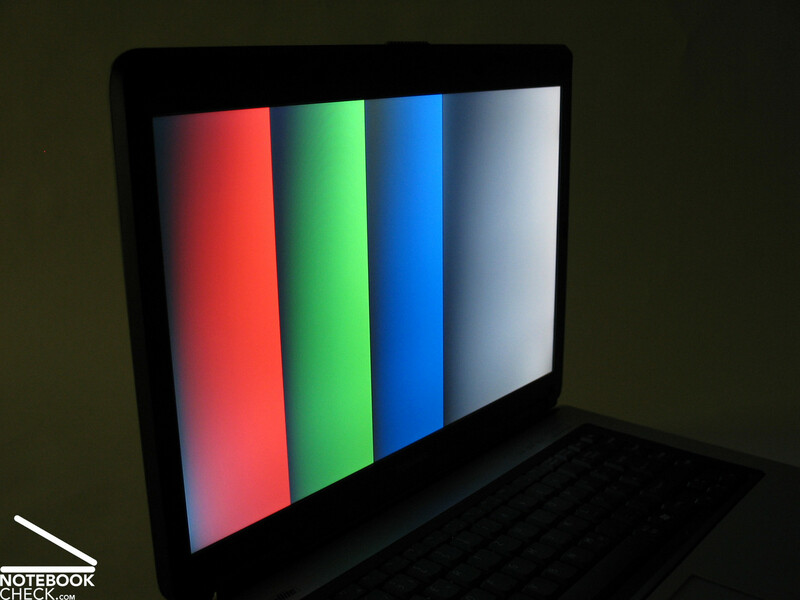 Because of the matte display and its passable brightness, the screen of the Toshiba Satellite L40-14N should also be reasonably fit for outdoor usage. Although the brightness could be a little bit higher in this aspect, the non-reflecting surface nonetheless allows trouble-free work even when the light conditions are only moderate. Rather narrow viewing angles are a weakness of the provided screen. Vertically, you'll face whitening respectively darkening if your viewing angle even only slightly deviates from the ideal. Horizontally, there is a clear contrast loss. 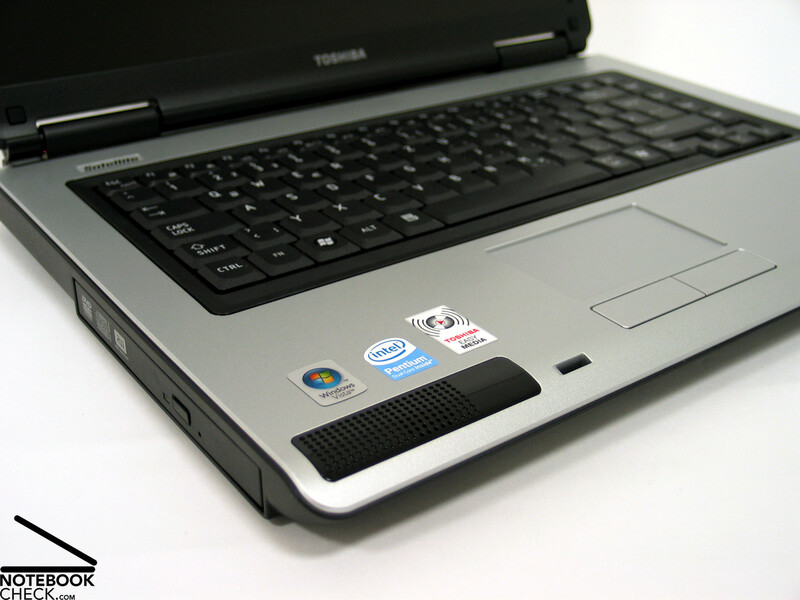 While many notebooks are nowadays equipped with Core 2 Duo CPUs, the technical specification of the Toshiba L40-14N lists a Dual-Core CPU with a clock rate of 1.46 GHz, which is a rather low rank CPU today. 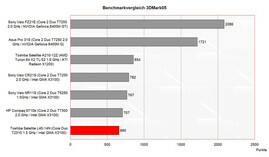 Although the T2310 CPU is based on Core 2 Duo CPUs (including 64 Bit support), it is only equipped with 1MB L2 Cache. Though the clock rate of the CPU is rather low, it benefits from the dual core technology inherent to dual core processors, which unites good performance and low energy demand. Particularly with regard to the CPU, the Intel GMA X3100, an integrated video chip, is appropriate. Although it is not equipped with dedicated memory, it can dynamically use up to 358MB of RAM, if the laptop is equipped with at least 2GB RAM. 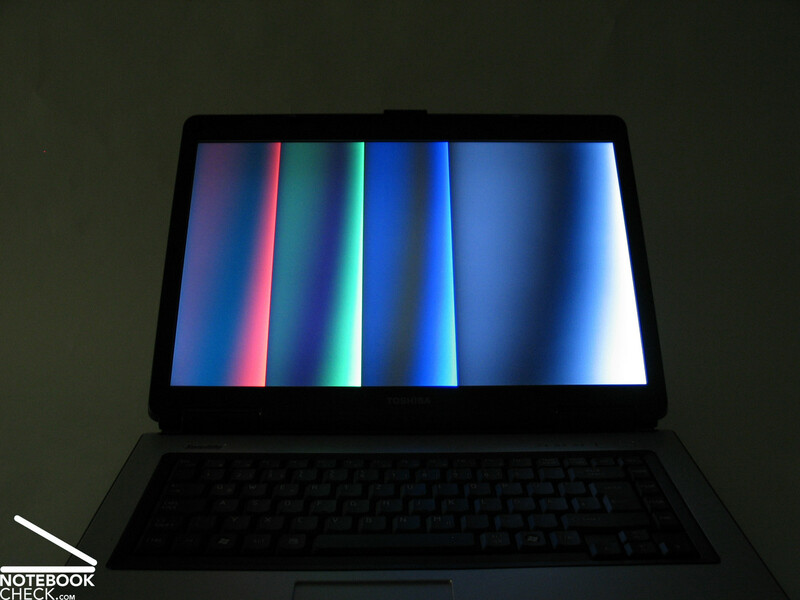 However, the reviewed notebook was only equipped with 1GB RAM, so, less memory can be allocated for video processing. This is also the primary disadvantage of the Satellite L40-14N. The pre-installed, memory demanding Windows Vista operating system uses already most of the available RAM. Furthermore, also the integrated video chip needs a part of the RAM. So, only little RAM is available for applications, which can worsen the performance. Therefore, we would highly recommend a memory upgrade, so that the notebook is equipped with a total of 2GB RAM. Due to a maintenance opening at the bottom side, it is easy to change memory modules. However, you'll need to buy two new 1GB modules, because there are only two slots and these are already occupied by two 512MB RAM modules. If you consider a CPU upgrade, there are not many options available. The Intel GL960 express notebook chip set supports only up to 533 Mhz FSB processors. 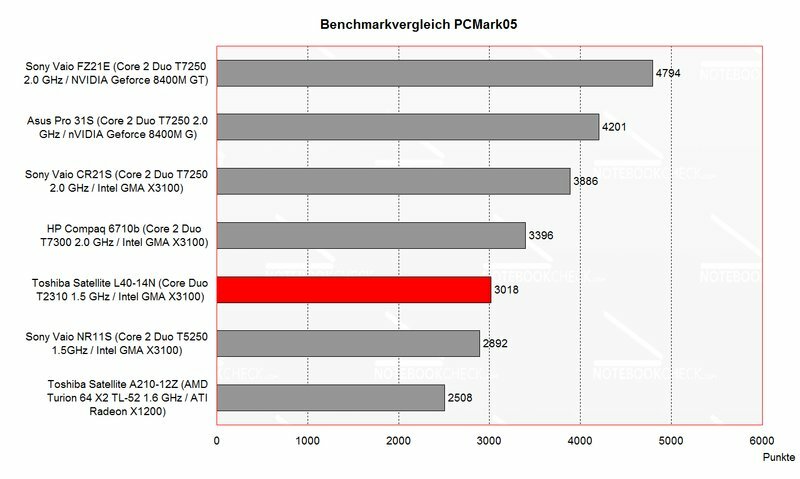 So, most of the up-to-date Core 2 Duo CPUs (with 667MHz) cannot be used. 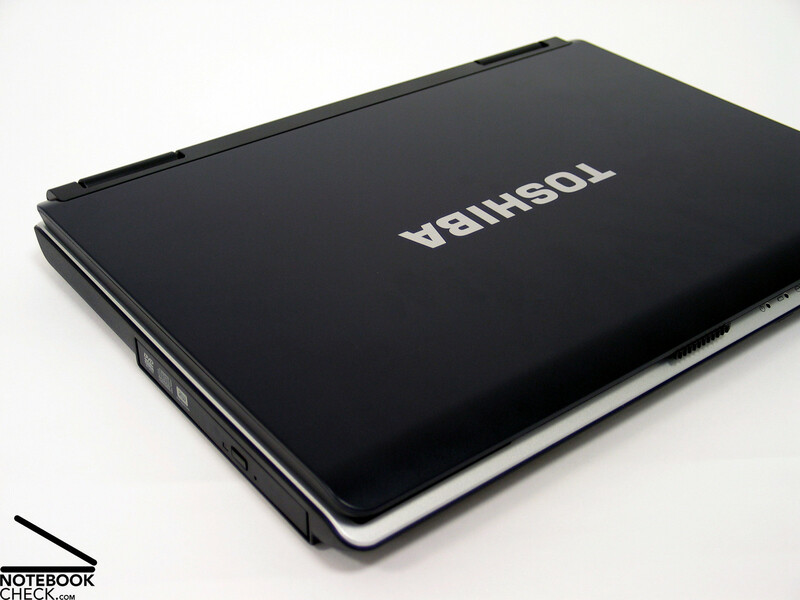 The Toshiba Satellite L40-14N is a typical notebook for text processing, browsing the Internet, watching movies, and listening to music. The performance is adequate for these purpose. 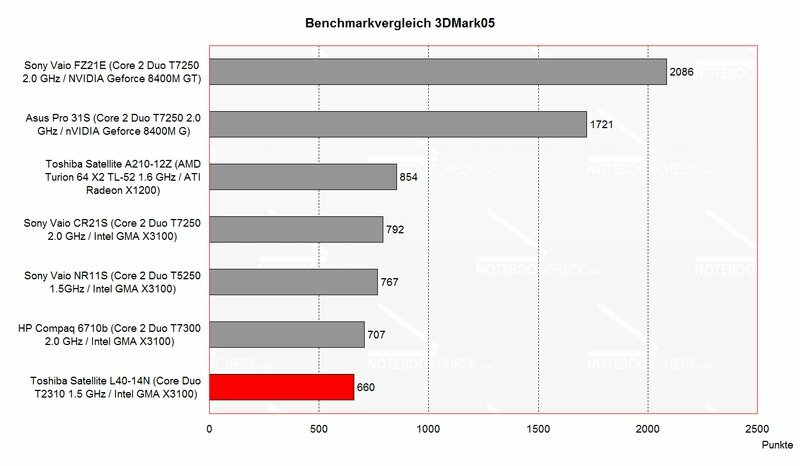 If you focus on better performance, you should definitely consider upgrading RAM and CPU. 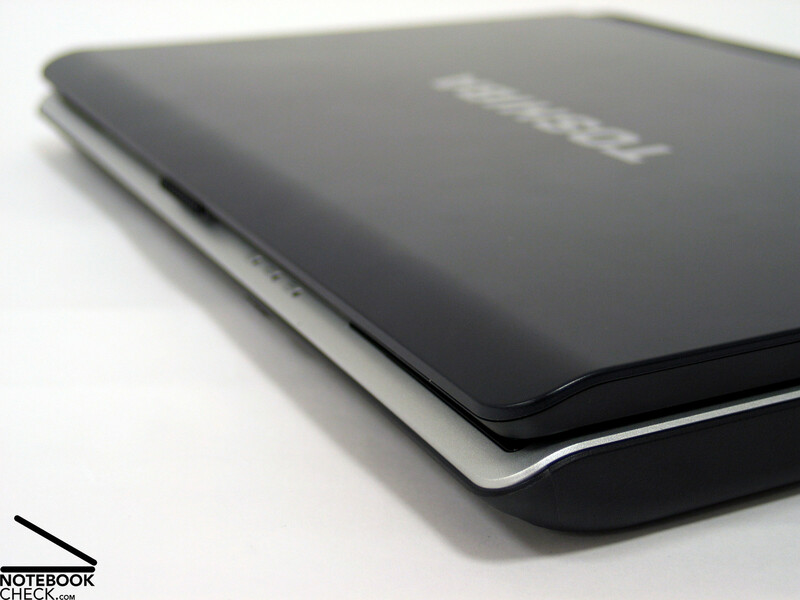 During our review the Toshiba Satellite L40 was rather quiet without load (idle mode) and it's noise emissions stayed low during text processing and browsing the Internet via WLAN. 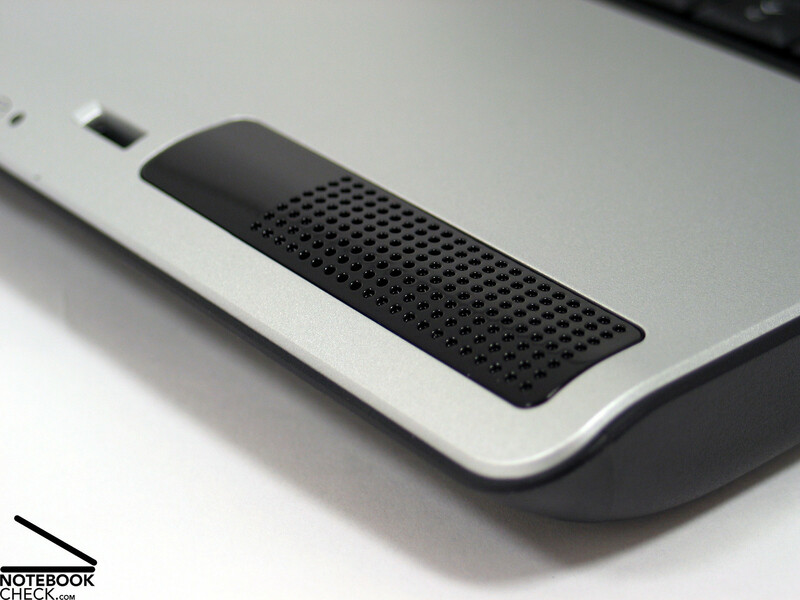 The built-in hard disk was also hardly audible. Although the fan sped up under load, the noise level got never annoying. Although the maximum temperature was as high as 43.4°C at the bottom side, this is still alright. The top side stayed very cool. The maximum temperature of 36.8°C was measured near the back. The two speakers are left and right at the front edge of the base unit. Their sound is rather passable. Compared to other office notebooks even the basses are acceptable. Overall, the speakers are fit for rather good music playback. The sound output via 3.5mm stereo out is also alright. 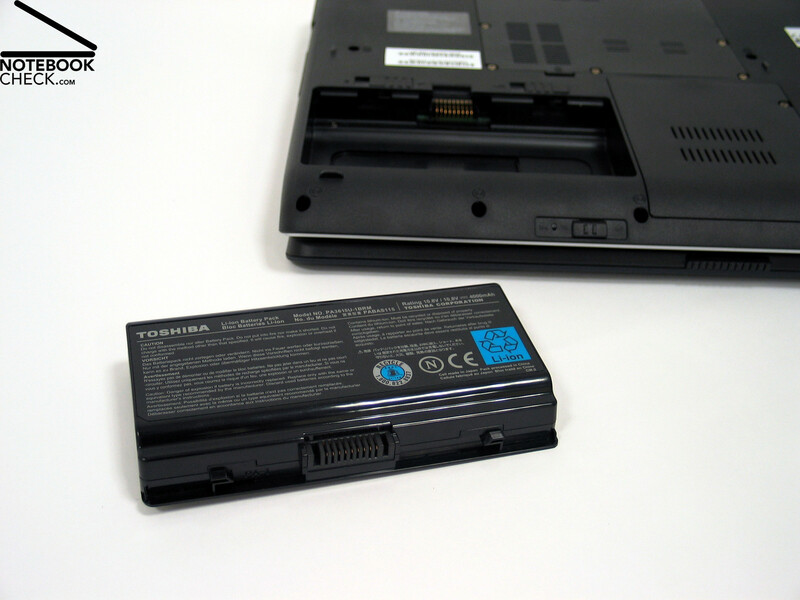 The Toshiba Satellite L40-14N is equipped with a lithium ions battery with a capacity of 4000 mAh (43Wh). The measured runtime in battery mode ranges from about 80 minutes under load to a maximum of about 3 hours at minimum energy demand. Overall mobility is to some extent feasible. You can expect that the battery runtime will range from two to two and a half hour in practice. 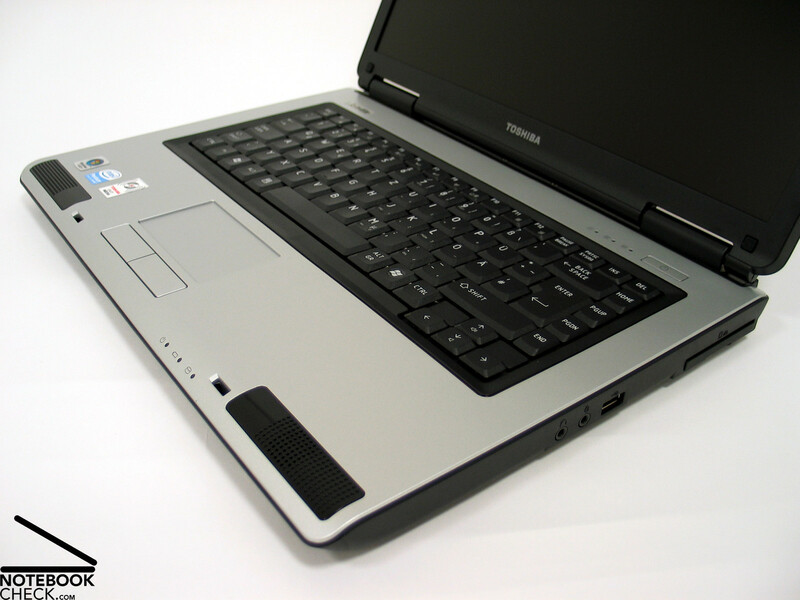 The Toshiba Satellite L40-14N is an office notebook whose equipment is kept to a minimum. It is able to comply with minimum demands, but, its main advantage is the low price. The L40-14N's case is decent. The workmanship is also good. Despite plastic is used at the surface parts, the stability of the case is convincing. In general the keyboard is alright. However, during typing we found that some keys wobble and clatter little bit. We did not like the touch pad buttons, because to much force is needed to use them and, furthermore, their clicking noise is too loud. We were pleased that the display has a matte and non-reflecting surface. Typically only business notebooks provide such a display. The measured brightness was also alright. The weakness of this panel is basically its narrow viewing angles, which could perhaps cause problems during mobile use. 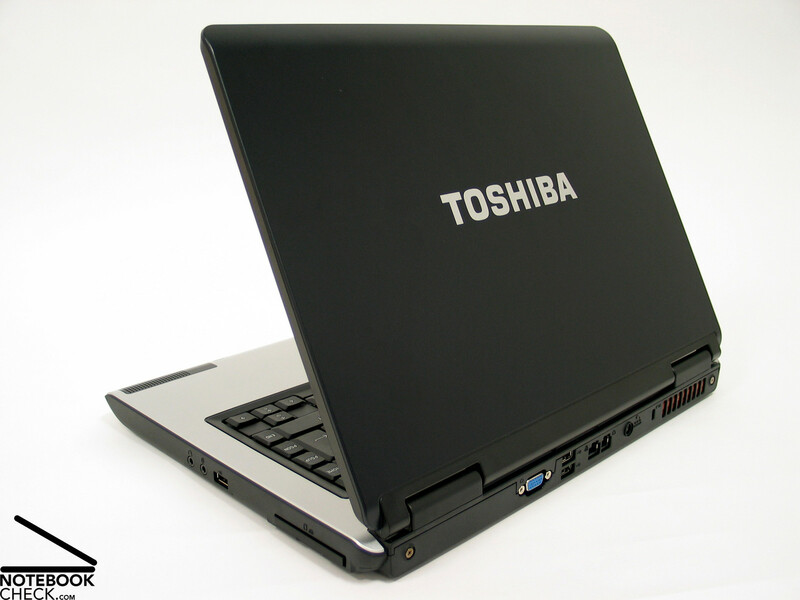 Regarding performance the Toshiba L40-14N is equipped for office work and adequate for these demands. However, there are hardly any reserve capacities. Especially the available RAM can soon turn out to be a real bottleneck. 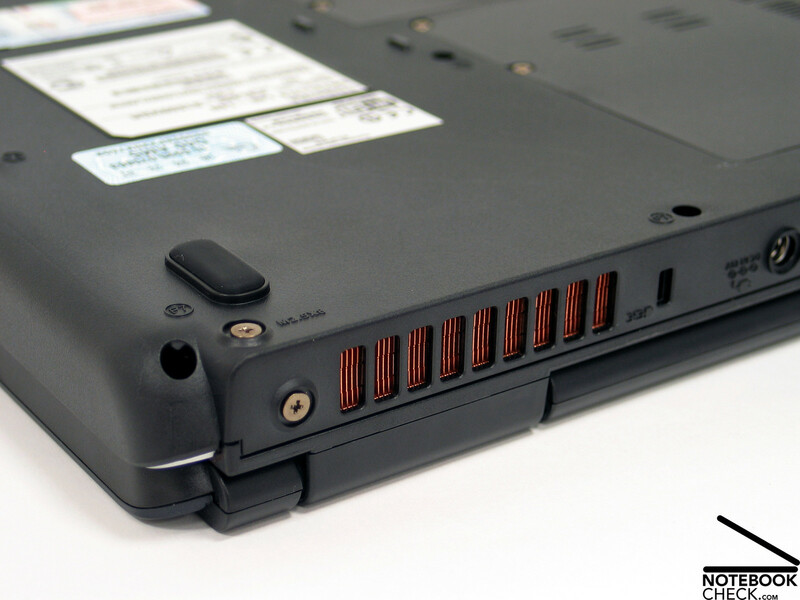 The Toshiba L40 scores points regarding emissions. It is very quiet in idle mode and also the surface temperature stays within admissible range. The battery runtime ranges from a little above one hour under load to a maximum of 3 hours. Though limited, a mobile use of the L40 is possible. Many thanks to MediaMarkt Wels, who kindly provided us with the reviewed notebook. You can also buy this notebook there. The sound of the two speakers, located at the front edge, is alright. The surface temperature of the L40 stays also always within admissible range. 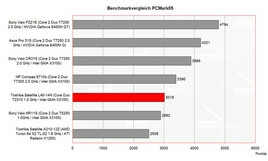 Because of its hardware, the fan only needs to run under load. 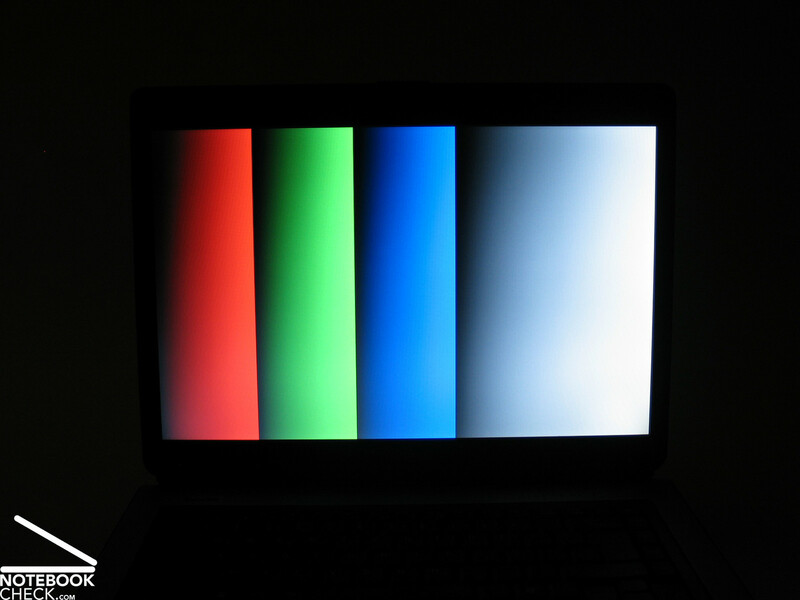 The WXGA display had a matte surface and a passable brightness. However, the viewing angels are rather narrow. We didn't absolutely like the keyboard, because it clatters a little bit. The interfaces provided by the L40-14N conform to the absolute minimum requirements. There are, e.g., USB and VGA. ...so, it scores points regarding stability of the case. ...the L40 is indeed a typical Toshiba notebook. ...which matches its low price. The battery runtime of the 43Wh battery ranges from 1 to 3 hours.